A visit to the Puffing Billy is a must for railway buffs - and all the family! 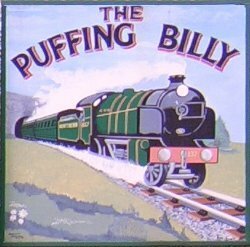 The Puffing Billy is a relaxed and friendly pub, restaurant and gardens, all within the Victorian surroundings of the former Torrington Station - and perfectly situated, right on the Tarka Trail! The owners and landlords, Phil and Carol Simkin, have painstakingly and thoughtfully restored the buildings to provide an environment for a truly unusual eating and drinking experience. Although the last train ran from Torrington in 1982, lots of memorabilia of the local line are on view including a goods brake van, coal truck and buffet carriage on a restored stretch of track, adding to the feel of yesteryear. The restored old waiting room serves as a restaurant (at one end is an aviary with parrots!) and culinary delights are created and cooked by Carol, an accomplished and imaginative chef. Phil is host to the bar and offers fine wines and superb local real ales. Carol also provides Gluten-free food and caters for those who require a Coeliac diet!